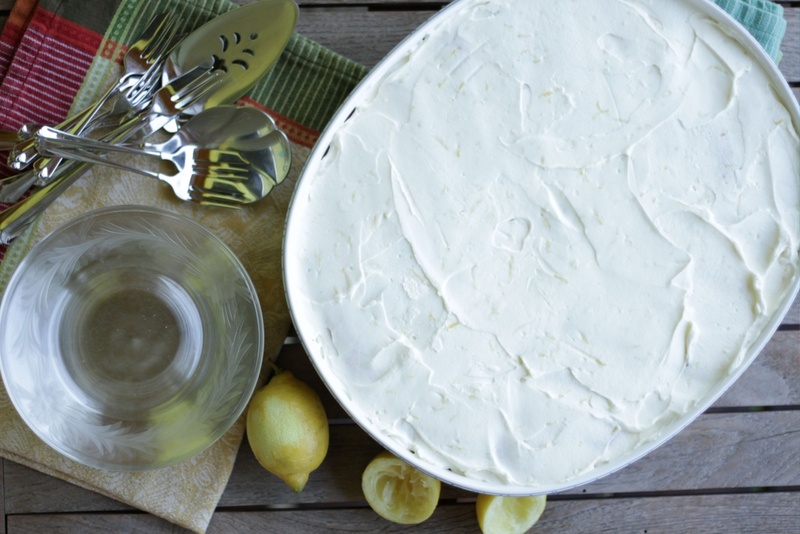 An indescribably delicious, no-bake creamy dessert that tastes like lemon heaven. The mascarpone cream is from my Tiramisu Cupcakes and is made without the eggs that tiramisu traditionally calls for so there’s no need to worry about handling raw eggs in the summer. Enjoy! Make this ahead so it can chill 8 hours or overnight. Finely grate the zest of the lemons and juice the lemons. In a small saucepan, bring the lemon juice and the ¼ cup sugar to a boil to dissolve the sugar. Stir in the Limoncello. Pour the lemon syrup into a medium-sized bowl and set aside to cool. Beat mascarpone, cream cheese and powdered sugar together until smooth. Add the heavy cream and beat for 1-2 minutes until light and fluffy. Fold in the lemon zest. Dip both sides of the lady fingers one at a time into the lemon syrup and lay them in a single layer covering the bottom of an 8x8 or 9x9 inch (18x28 cm) glass or ceramic baking dish. Top with a third of the mascarpone cream and spread smooth. 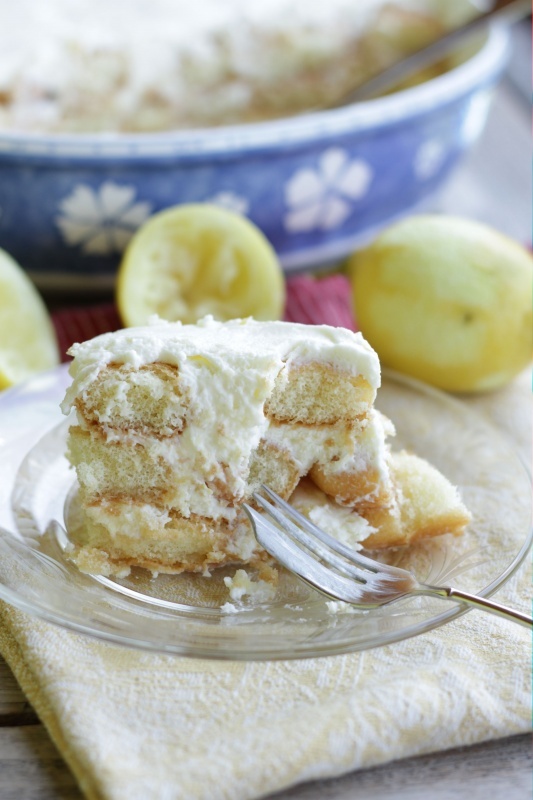 Layer more lady fingers dipped in lemon syrup on the mascarpone cream and top with another third of the mascarpone cream, repeating to make three layers, finishing with the mascarpone cream and spreading it smooth. Cover with plastic wrap and refrigerate for several hours (or overnight). Pictured is a double recipe made in a large ceramic dish that serves 10-12. 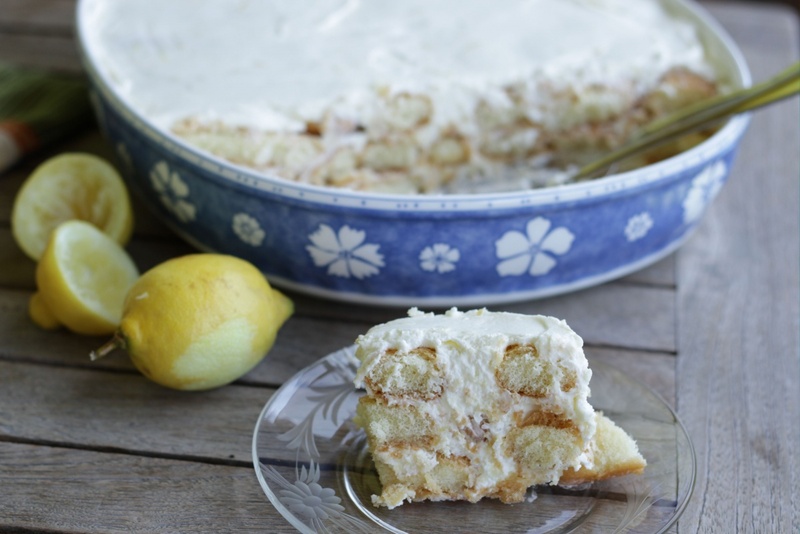 Recipe inspired by: Lemon No-Bake Icebox Cake from Lauren’s Latest. Lemon syrup adapted from: Zitronen-Tiramisù von Das Trüffelschwein.